UNCASVILLE, CONN. – June 25, 2018 – Barrett-Jackson, The World’s Greatest Collector Car Auctions®, delivered another incredible record-breaking automotive celebration during its 3rd Annual Northeast Auction, June 20-23, 2018, at Mohegan Sun in Connecticut. During the four-day event, 662 vehicles crossed the block with a 99.25 percent sell through rate, selling for more than $24.9 million, while 457 pieces of automobilia brought in over $832,000. Barrett-Jackson also fueled support for charity by raising $1.245 million from the sale of five vehicles, including the historic sale of Dodge’s last production 2017 Viper and 2018 Challenger SRT Demon for $1 million. 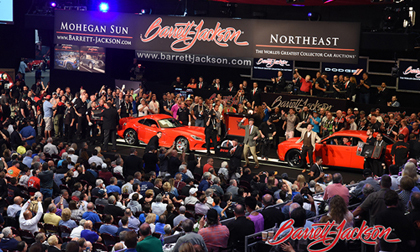 In total, Barrett-Jackson set a Northeast Auction sales record, reaching nearly $27 million in total sales.